The detention of nine members of an Italian medical NGO in Helmand Province, southern Afghanistan, on charges of “terrorism and assassination” has embarrassed aid workers across the country. “I was shocked by the news,” Laurent Sailard, director of ACBAR, a consortium of over 100 Afghan and foreign NGOs in Kabul, told IRIN. “It was bad and unexpected news,” said Shir Shah, a health contractor in Helmand Province. The Ministry of Public Health said it was “startled” by the news and was waiting for further details. Police and intelligence agents stormed a hospital in Lashkargah, the provincial capital of Helmand Province, on 10 April arresting three Italians and six Afghans working for the NGO, called Emergency. The governor of Helmand, Golab Mangal, at a 10 April news conference showed journalists suicide vests, pistols and ammunition purportedly found inside Emergency’s hospital. “We’re not accusing Emergency - the organization - of wrongdoing but we have solid evidence that some of its staff, primarily Garatti, backed terrorist activities and was bribed by the Taliban,” Dawood Ahmadi, a spokesman of Helmand’s governor, told IRIN. “Why should our international staff risk their life and career to kill an Afghan governor,” said Cecilia Strada, Emergency’s president, adding that the organization was “extremely worried” about the safety of its staff in Helmand. In April 2007 Taliban insurgents released a kidnapped Italian journalist, Daniele Mastrogiacomo, in exchange for the release of five Taliban prisoners by the Afghan government. The insurgents, however, beheaded Ajmal Naqshbandi, a colleague and translator of Mastrogiacomo, apparently after Kabul refused to swap him for additional Taliban prisoners. In May 2007 Afghan intelligence forces detained the head of Emergency’s hospital in Lashkargah, Rahmatullah Hanafi, on charges of brokering a half-fulfilled deal with the Taliban which culminated in Naqshbandi’s death. In reaction to Hanafi’s arrest Emergency suspended all its humanitarian medical activities in Afghanistan for two months. Emergency has been operating in Afghanistan since 1999 and has provided health care to about 2.5 million conflict-affected Afghans, the NGO said. 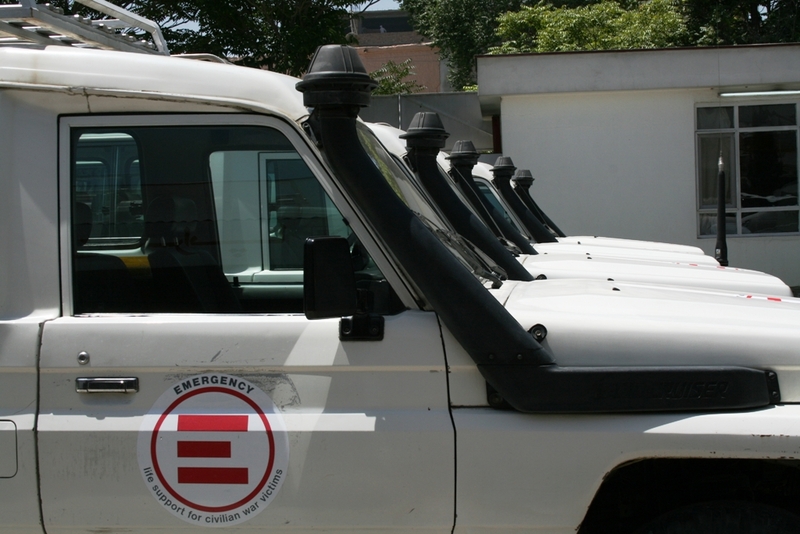 It runs three hospitals in Kabul, Helmand and Panjshir provinces and supports 28 first aid posts across the country. The hospitals in Kabul and Panjshir were functioning on 11 April but the hospital in Lashkargah was closed on 10 April, according to the Health Ministry. “The hospital in Lashkargah has been occupied by the Afghan police and we don’t have any responsibility there,” Emergency’s Strada told IRIN. The International Committee of the Red Cross (ICRC) said it would not comment on the arrests of Emergency’s health workers, but an ICRC spokesman in Kabul, Bijan Farnoudi, said he hoped the ability of the hospital to provide health services in Lashkargah would not be adversely affected. Under international humanitarian law the sanctity of health centres should be respected by all belligerent parties, and health workers should not be attacked or harassed. Sick and wounded fighters are entitled to free treatment. At least two aid workers said they thought some government officials had failed to understand or respect international humanitarian law. “For aid agencies to access communities and deliver assistance they need to maintain direct or indirect contacts with all warring parties and this must not be a source of problems for NGOs,” said Sailard of ACBAR. Health contractor Shir Shah said the government must make it clear it does not consider the treatment of wounded or sick Taliban fighters to be a crime. The Health Ministry said it supports “impartial and neutral” health services but warned that the government would not allow the exploitation of health work for political, military or other illegal purposes.